Are you new to Twitter? Do you want to use it to promote your blog, business, or just follow some interesting people? Over the past few weeks, I’ve heard people new to twitter say they are overwhelmed by it. Don’t be afraid. It’s a great tool and a great way to meet new people. I’ve been using it since 2007 and have some twitter tips for newbies that will ease your fears and help you enjoy this social media tool. 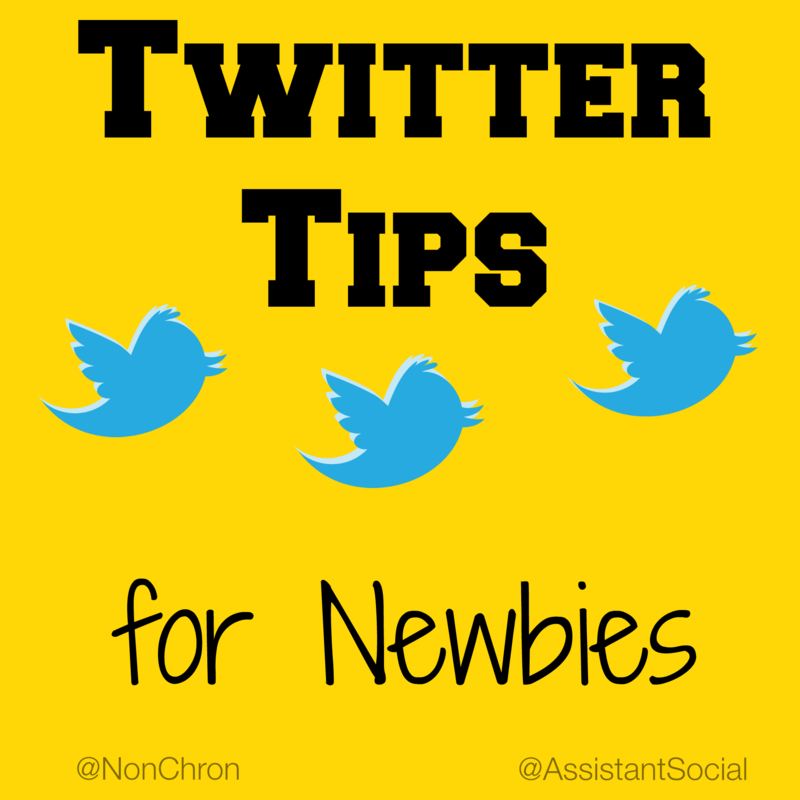 Twitter Tips for Newbies #1 Don’t fear the feed. You cannot read everything everyone posts unless you are only following two people who only post at 1:00 PM Mountain Time on Mondays. Seriously, just let this one go. Twitter is more about real time. It’s kind of like listening to the radio. You can’t listen to every channel at the same time. You tune in when you feel like it or can. Listen to what’s on, then go about your life. OK, so maybe there are a few people whom you want to follow more closely than say ABC news or Mashable. Make a list and put them on it. Lists are a great way to control the twitter feed and get a deeper experience. Maybe there are some local people you follow and want to chat with more than a few random bloggers 1,500 miles away. Make a list and you can read their feeds separate from the 200 other people, brands, or news outlets you follow. For the past 5 years, Twitter has been the go to place for me for breaking news. I learned about the earthquake in Japan, Osama bin Laden’s death, and which ever celebrity most recently died via Twitter. Sure, I always made sure whoever was tweeting was a reputable source before I shared the info with anyone else. There have been quite a few news hoaxes, but smart people know to double check before believing something Generic Twitter Dude 1531 shared that sounds unbelievable. Also, be sure to follow your local news sources as well as national ones. These are great ways to find out why there is smoke filling the sky 5 miles away or if your path to work might be flooded. Depending on why you use Twitter in the first place, remember it is social media. People and companies will share links to their blogs, products, and giveaways, but there is almost always a human being on the other side of that tweet. Don’t be afraid to reply to someone who wrote something interesting or even just ask a question. Interact! Even if it’s just a retweet or a favorite, someone will appreciate it. There really is no right or wrong way to use Twitter. You get out of it what you want. I like to say it’s like hanging out at a bar. You can chat with the folks around you or you can just listen. There’s a great opportunity to meet people, especially if you are new in town. I’ve made some really good friends through Twitter, including my husband. What are your fears about Twitter? What tips would you share with someone just starting out on Twitter? Great tips! I keep forgetting about using my lists…I should make it a priority to get those organized this weekend. And yes, twitter is a great place to BE social. Yeah, I’m not the best at lists, but they are useful. You can also subscribe to other user’s lists, which can help you find even more interesting users to follow. Retweeting is just taking something someone else tweeted & sharing it to your timeline. It’s a great way to share content you like with those who follow you. Good luck and thanks for stopping by! Lists! Why do I not take advantage of them?! Great tips and a reminder to relax and have fun. It’s not brain surgery, it’s just Twitter! Visiting from SITS Sharefest. Exactly! It’s not brain surgery. It’s not a full time job, although for some people it is, but for those just starting out, enjoy it. Heather recently posted…Weaning – I Just Can’t Do It. Thanks! Yes, the lists are helpful. It’s one of those chores I tend to forget about. I found twitter so intimidating at first. it took me months to get used to it. I’m still learning but liking it a lot more now. Thank you for linking up to the Bloggers Brags Pinterest Party. I have pinned your post to the Bloggers Brags Pinterest board. Thanks! I’m glad people are finding the tips helpful. It really is a fun social media channel. I love these Twitter Tips! I’m still learning the ropes of Twitter (I know, I know, I’m late to the game). So I’ve been eating this stuff up! At first the feed was overwhelming because I kept trying to read EVERYTHING. Once I learned that it was a futile effort, I became much more willing to follow people! I’m trying to buckle down and make some lists. But it really is fun! I’m kind of sorry I waited so long! Thanks! I’m glad you found them helpful. I’m not the best at lists either, but I know they are useful. Great! Thanks so much! I’ll be sure to share the post. Visiting from sitssharefest. Great tips. I have to admit it’s been totally overwhelming. Lists–must try that! Hi! Found you via SITS SHarefest! I have recently discovered my love for twitter. I love the real time aspect that exists during Twitter parties. I also like being able to connect directly and instantly to anyone that you find on the web as well as connect directly to national companies. Twitter has taken me a while to get used to over the years, but I have learned to love it, especially the people. It is a great place to connect. Thanks for sharing your twitter tips. Glad I found you on SITS today! Thanks for stopping by! Yes, Twitter really is a great way to connect with people. Tweetups are also a great way to meet local folks in real life. Great tips and some really good advice! I need the lists. I haven’t used that and it must be important!! Thanks for a great post. I am a twitter dummy! I am new to twitter so these tips are really useful. I will be making lists today and start being more social! Dropping by from SITS. Found you via SITS today. 🙂 Love these Twitter tips. I never thought of checking out my local news using Twitter. Definitely might keep me better informed! Great tip – all of them were! Thank you much! Marcia @ Blogitudes recently posted…AhhHaHa! My Blogging Creation Lives & Just Turned One! First off, I am in LOVE with your blog title and especially tagline!!!!!! Post pinned, off to follow you AND figure out how to make a twitter list. Secondly, I got a Twitter account when Twitter first became Twitter and no one had ever heard of them I don’t know how many years ago. I had NO IDEA what to do with it and only used it if I was entering a giveaway that increased my chances if I tweeted! I had a Twitter epiphany last week and finally realized what it was all about. So thanks for the tips! The radio / radio station analogy is great!